The Bison women’s basketball team has been working hard over the past few months in preparation for the 2018-2019 season. After concluding last season with an overall record of 22-10 and finishing 15-3 in Patriot League play, the Bison are ready to make strides. In the preseason Patriot League coaches’ poll, the team is predicted to finish first for the third year in a row. With high expectations to live up to, the Orange and Blue will turn to their strong senior class to lead the way. Guard Kate Walker ’19 was named First Team All-Patriot League last season. Meanwhile forward Kaitlyn Slagus ’19 received recognition as Second Team All-Patriot League last year and is one of the most dangerous forwards in the league. Also receiving an honor was guard Kyi English ’19, earning a spot on the Third Team All-Patriot League last season. Other key returners for the Orange and Blue include forward Autumn Ceppi ’21, a strong defensive player, and forward Tessa Brugler ’21, another strong asset under the basket. Many members of the team will look to contribute to the team’s scoring. Guard Abby Kapp ’21 has a solid long-range shot, and was named to the Patriot League All-Rookie Team last season. Walker is excited to start games and see how all of her team’s hard work in the offseason will pay off. The Bison will look to capture another Patriot League championship in the 2018-19 season and clinch their first trip to the NCAA tournament since 2017, when they earned a spot as a 14 seed and fell in the first round to Maryland. 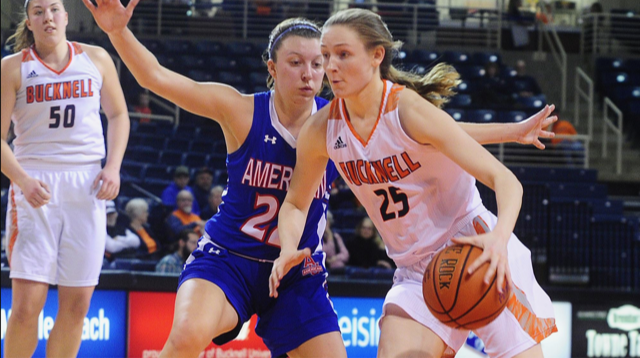 The Orange and Blue opened their season on Nov. 6 with a 70-32 victory over Monmouth. Walker and Slagus led the team with 12 and 11 points, respectively, in the dominant victory effort. Their home-opener will be on Nov. 11 against Quinnipiac.